I feel like I have been talking about the weather a lot lately, but seriously... it's out of control! Even as a born Midwestern girl (who even spent 5 years living on America's second snowiest college campus), this is definitely the worst winter I have seen in my 29 years. Between the excessive snow and the bitter cold, it has definitely been a winter for the record books. This has also been the first winter in a long time that I have really maximized the use of my slow cookers. I use them pretty regularly for soups and sauces, but this winter they've been real assets when it comes to making warm dinners on very chilly nights. And while we still try to brave the frigid air and venture out for a date night once a week, we have enjoyed several cozy Friday night dinners straight from the slow cooker in front of the fire while watching one of several TV shows we have become addicted to during this winter hibernation. Lately that's been Orange is the New Black, The Newsroom, and Downton Abbey. 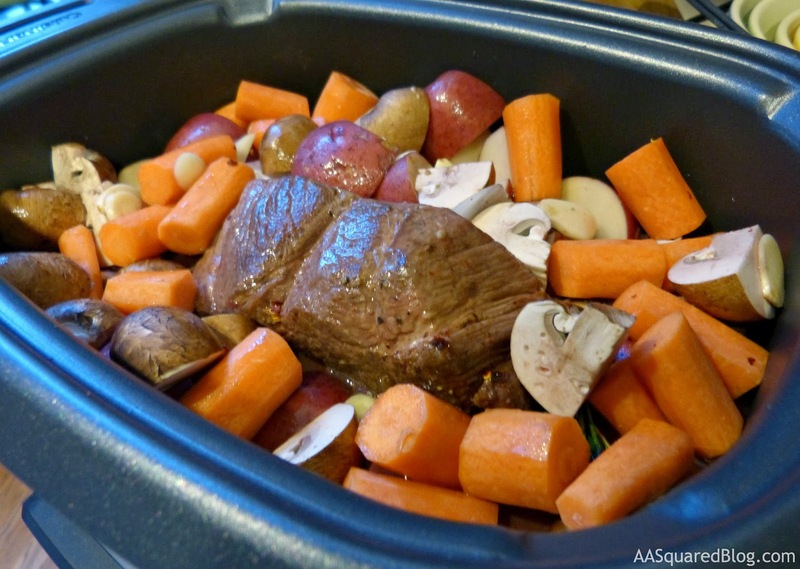 Recently, I made this Italian spin on a traditional slow cooker pot roast and it was delicious! This dinner was so easy to put together and is a literal one pot meal. If you have a newer slow cooker like my Cuisinart 3-in-1 you can even brown the meat right in the slow cooker instead of dirtying another pan too! Genius. This pot roast is the ultimate in comfort food. In the slow cooking process, the beef becomes fork tender and the vegetables tender. And the flavors here are really wonderful-- the kinds that get better and stronger the longer it cooks. I love the combination of a bold Italian red wine like Chianti, the woodiness of rosemary, and just a touch of sweetness from tomato paste. 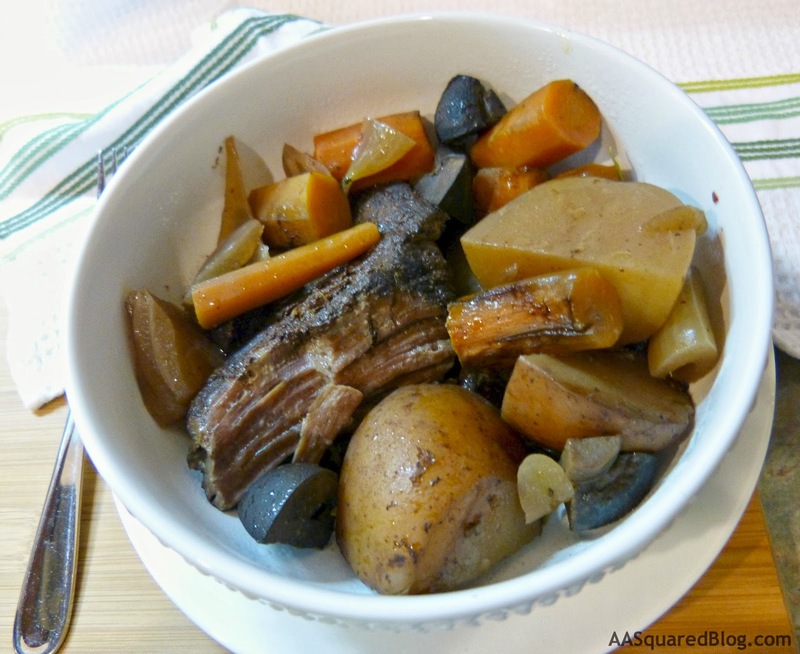 It makes for a perfect cooking liquid and a delicious broth to serve this pot roast with. It's tasty enough to serve to company, but easy enough to make for a weeknight dinner. Preheat a skillet over medium high heat. Season the roast well with salt and pepper and add to the skillet. Brown on all sides and place in the center of a slow cooker. Add onions and next 6 ingredients (through bay leaf) to the slow cooker, arranging evenly around the roast. In a medium bowl, whisk Chianti, broth, and tomato paste together. Stir in red pepper flakes and additional salt and pepper, to taste, and pour over the mixtur in the slow cooker. If desired, remove the lid, turn heat to high, and cook for another 30 minutes to hour to allow the liquid to evaporate and thicken slightly. Carve roast into individual servings and serve warm with vegetables and cooking liquid in shallow bowls.